Cricket has an unclear origin, but it probably was developed in medieval England before 1400 – by the end of the 18th century, it became the national sport in England. Cricket has a long and illustrious history in Hawaiʻi dating back to the mid-nineteenth century. It is believed that the game was first played in Hawaii by Scottish engineers working at sugar companies in Oʻahu, the Big Island and Maui. Established in 1893, Honolulu Cricket Club is the oldest sporting club in the Pacific (according to Guinness World Records) and the second oldest cricket club West of the Appalachian Mountains. One of the first enthusiast cricket supporters in Hawaiʻi was Alexander Liholiho (1834-1863), King Kamehameha IV. Reportedly, English cricket was one of the King’s favorite games. The first cricket pitch in Honolulu is near where Makiki District Park is located and was known as the Makiki cricket grounds. There are several reports of teams travelling around the islands playing local teams, as well as crews from visiting ships. Cricket is a bat-and-ball team sport for two teams of eleven players each. A formal game of cricket can last anywhere from an afternoon to several days. Although the game play and rules are very different, the basic concept of cricket is similar to that of baseball. Teams bat in successive innings and attempt to score runs, while the opposing team fields and attempts to bring an end to the batting team’s innings. A cricket field is a roughly elliptical field of flat grass, ranging in size from about 100-160 yards across, bounded by an obvious fence or other marker. There is no fixed size or shape for the field, although large deviations from a low-eccentricity ellipse are discouraged. In the center of the field, and usually aligned along the long axis of the ellipse, is the ‘pitch,’ a carefully prepared rectangle of closely mown and rolled grass over hard packed earth. Behind each batsman is a target called a wicket. One designated member of the fielding team, called the bowler, is given a ball, and attempts to bowl the ball from one end of the ‘pitch’ to the wicket behind the batsman on the other side of the pitch. The batsman tries to prevent the ball from hitting the wicket by striking the ball with a bat. After each team has batted an equal number of innings (either one or two, depending on conditions chosen before the game,) the team with the most runs wins. Gamers use terms like: Arm Ball, Asking Rate, Ball Red, Bat-Pad, Belter, Blob, Bosie, Bump Ball, Bunny, Bunsen, Chest-on, Chinaman Chin Music, Corridor of Uncertainty, Cow Corner and Cross Bat – and that’s only a few of the words from the A, B & Cs – there are tons more if you are really curious. Established ‘pitch’ cricket grounds are at Kapiʻolani Park and Baldwin Beach Park on the Hana Highway in Pāʻia, Maui. Reportedly, today, cricket is second only to soccer as the most popular sport in the world. According to the Honolulu Cricket Club on-line schedule, games are scheduled for Sunday mornings, starting at 10 or 10:30 am. 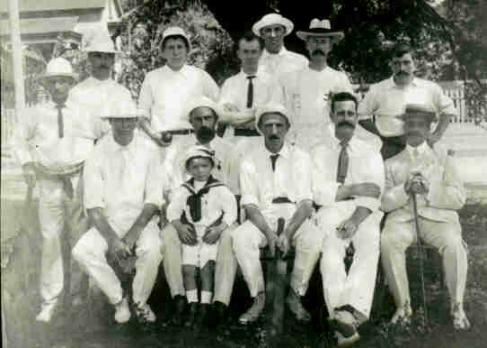 The image shows the Officers of the cable ship Restorer who played the Honolulu Cricket Club team in 1905. Info and images from the Honolulu and Maui Cricket Club websites. In addition, I have included other “Cricket” related images in a folder of like name in the Photos section on my Facebook and Google+ pages.